A Tennessee state representative is proposing a plan to use added fees on money transfers to fund a wall along the United States of America's southern border. 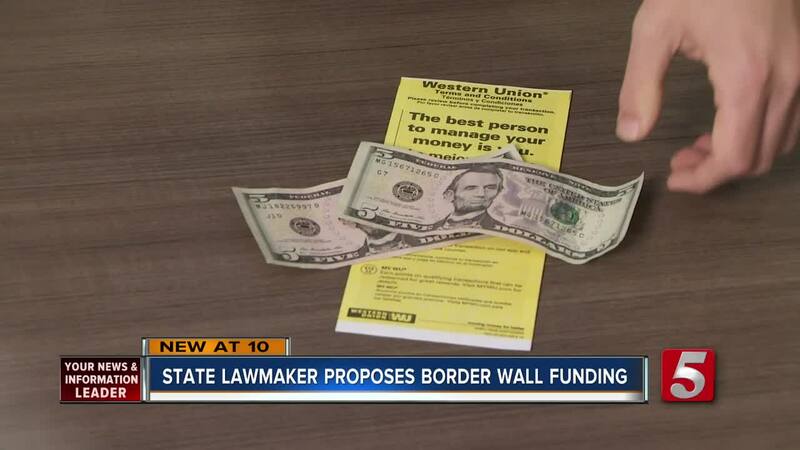 NASHVILLE, Tenn. (WTVF) — A Tennessee state representative is proposing a plan to use added fees on money transfers to fund a wall along the United States of America's southern border. Rep. Bruce Griffey (R-Paris) introduced the bill, which would add fees onto money transfers in the state of Tennessee. In a Facebook post, Griffey said the fees would only be applied to money transfered from Tennessee to people in Mexico, however the bill is much broader and, at its introduction, included money being sent "to a location within the United States or to a location abroad." There was no mention of "Mexico" in the original bill. The bill does add that customers may apply for a refund, but does not explain what that application process may look like. In his post, Griffey said if the wall couldn't be funded on a federal level then individual states must take action. The proposal would add $10 onto the money transfers. Half of that money would go to state agencies' efforts to stop money laundering. The other $5 would go to a fund designated to be given to the federal government to be used for border security. There is no indication whether the state is able to allocate money for a federal project. The bill reads if the money is unable to be given to federal authorities, the money raised would instead go to the state's general fund. People opposing the plan raised questions about its scope and its impact on Tennesseans. "Mexico is one of Tennessee's largest trading partners, and we would not want to be ruining that relationship with them at all," Andres Martinez, a spokesperson with Conexion Americas, said.